Our waiter dubbed this Ludo's take on vichyssoise. Simply put this was the best tasting dish of the night. The salty sapor of the fried potato and the gentle creaminess of the leek captured the essence of vichyssoise beautifully. The scallop and truffle were pure luxurious indulgence and though I couldn't really taste the truffle, the scallop was absolutely perfect. After our faux oyster we were presented with a mirror of sorts featuring a duo of real Kumamotos covered in a thin veil of lardo with mushrooms, scallions, and a chicken jus froth. The lardo gives the tender oysters a sense of richness while the smoke and jus give the dish a hearty sapor; the result conveys the wholesome homey sense of a roast chicken. After a brief trip to Japan, we changed gears and headed to Greece for the next course. 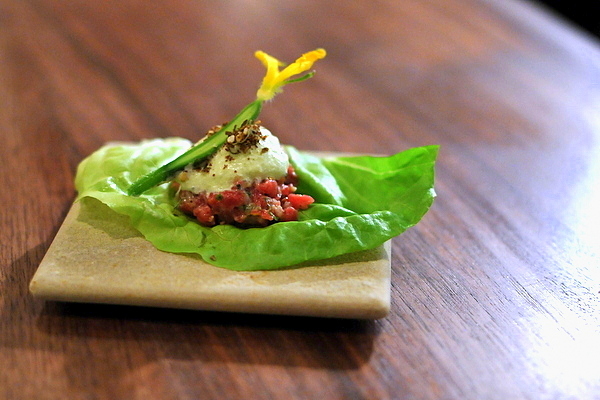 Despite being unabashedly raw, the lamb tartare is spiced in such a way to give it a savory gravitas while the yogurt provides a tart contrast that cuts through the richness of the meat. The duo is topped with a cucumber blossom and wrapped in lettuce which together add the right level of vegetal succulence to the mix. I've always been a fan of lighter preparations of salmon, but I have to say this was easily one of the most amazing pieces of salmon that I've ever tasted. 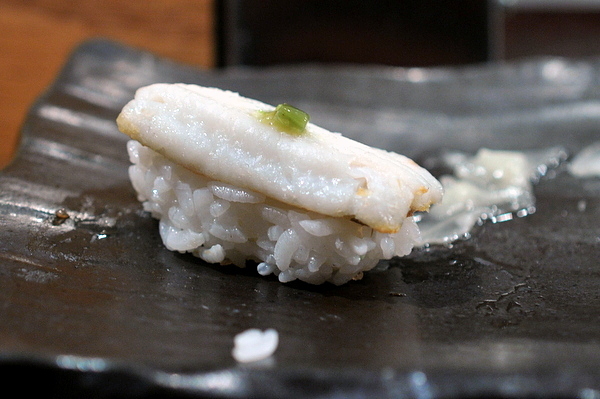 The fish itself is very lightly cooked which gives the flesh an exquisite and unique texture. The flavor conveys an abundance of sweet mustard that feels somehow balanced when taken with the oiliness of the fish while the shaved mango "tagliatelle" gives the dish a playful tropical tone. Feau's ingenuity was on display here. 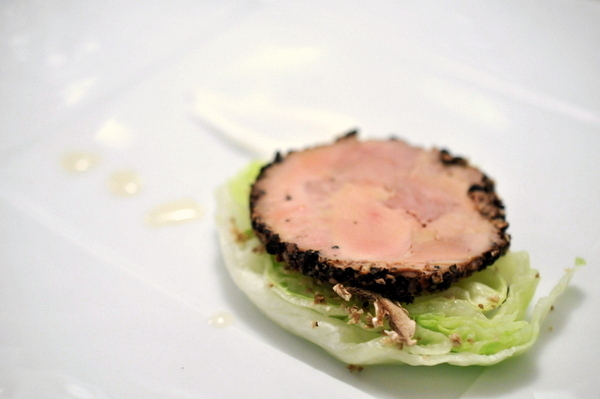 The foie gras was crusted with peppercorn for three days giving it a flavor similar to country sausage. 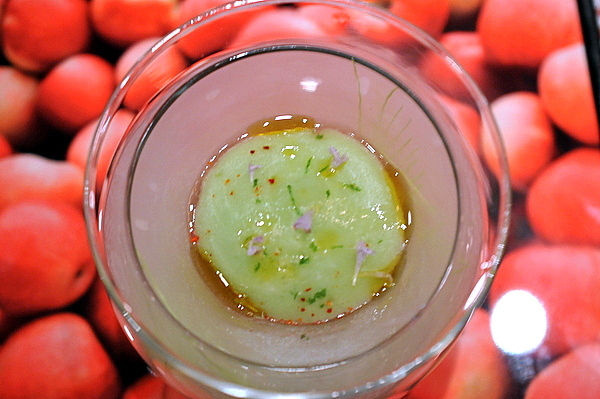 The iceberg lettuce provided the perfect moderating effect on the spicy "cured" foie. The two went especially well with the combination of Meyer lemon dressing and truffle honey which provided a flavor that was both cerebral and enchanting. Another one-off course, the Halibut cheeks turned out to be one of the night's best courses. 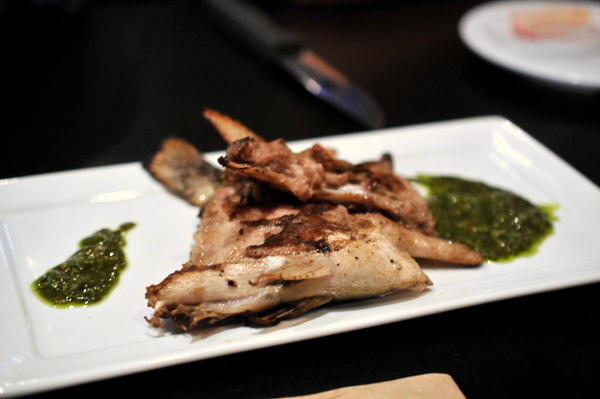 The meat is rich and immensely tender, charring in a 1200 degree broiler give the fish a smoky vitality that was a natural pairing for the zesty spice of the chimichurri. 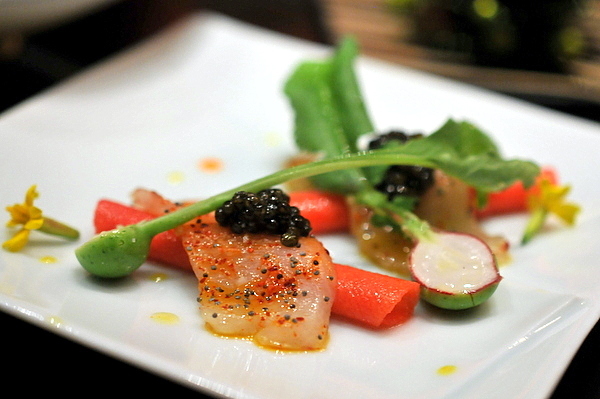 This next course puts your run of the mill tomato salad to shame. The tomatoes themselves are a delightfully sweet and complimented by a smoky relish from the bell pepper. Despite that the vegetables are more of an adjunct to the caramel. 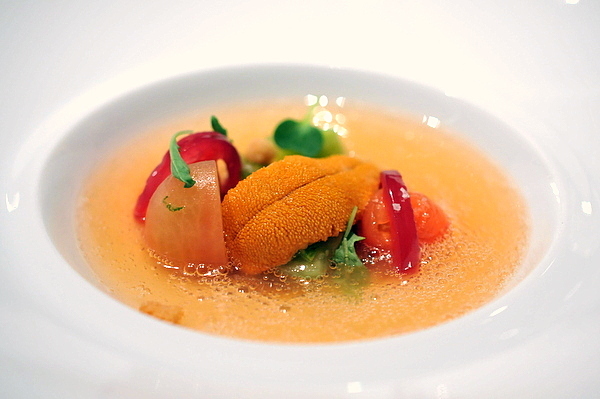 The mixture of tomato water and bonito, think thickened dashi, was a natural companion for the sea urchin roe. 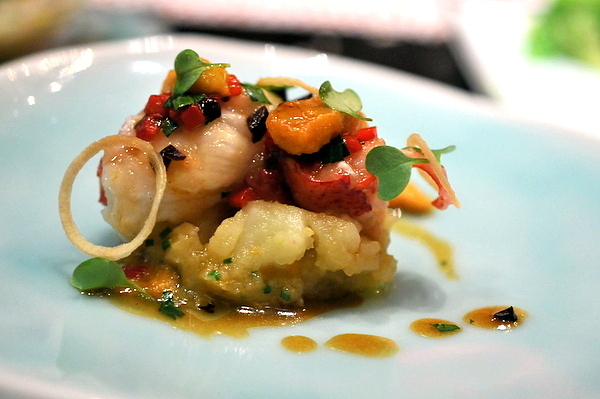 The Albarino was well suited to this course with a crisp acidity, notes of lemongrass and citrus, that complimented the salad and a saline minerality for the shellfish. 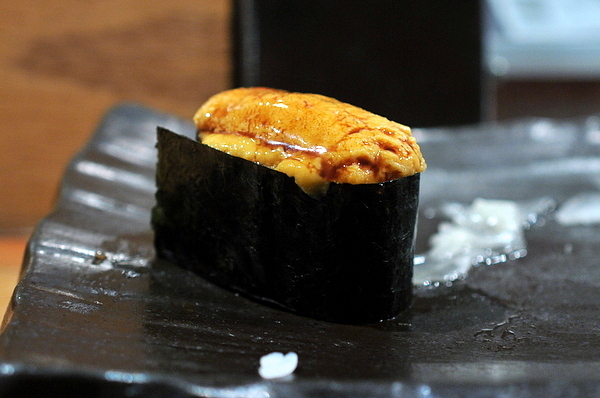 Sometimes referred to as the "foie gras of the sea" Lee uses the ankimo as a surrogate for the now forbidden fatty duck liver. During my previous visit I thought the ankimo's texture and flavor were a bit off but wasn't the case this time. 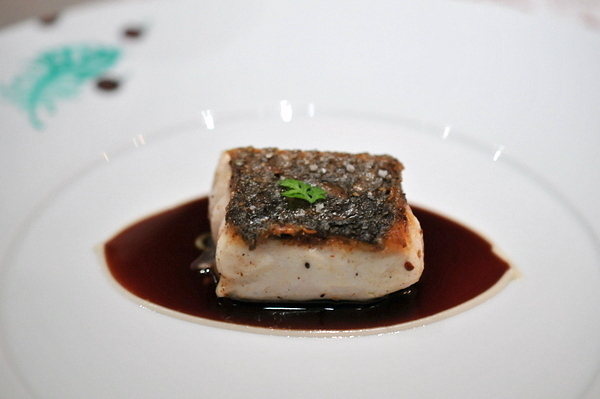 This version had a creamy texture and richness on par with the finest torchon from The French Laundry but with an abundant Mackerel-like fishiness that remains true to the dish's origins. 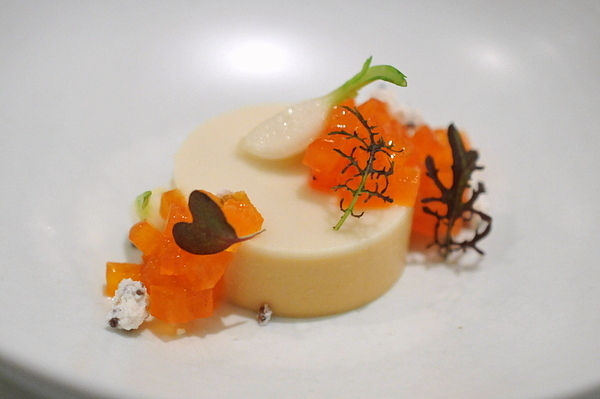 The persimmon and turnip give restrained notes of both sweetness and bitterness to compliment the liver. This ended up being my favorite course of the night, perhaps I missed foie gras more than I realized. 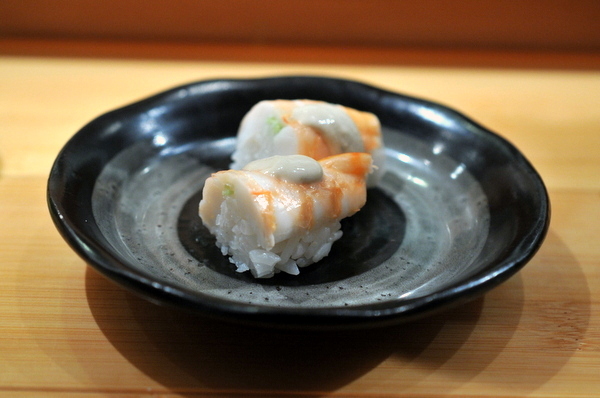 Sushi Murasaki is often included in discussions of Orange County's best sushi restaurants. I first tried the restaurant back in 2008 and found the experience a bit lacking. While the sushi showed some promise, the quality varied from piece to piece and the cooked food was absolutely atrocious. Since then I've been hesitant to go back but this time I figured I'd sit at the bar and do things the right way. 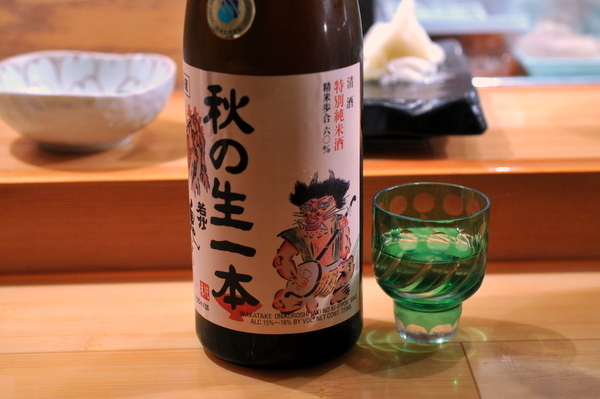 The regular Demon Slayer is one of my go to sakes, with a soft round sweetness and silky texture the sake has an easy-drinking balance. This is their Autumnal hiya-oroshi release which means the sake hasn't been pasteurized a second time. 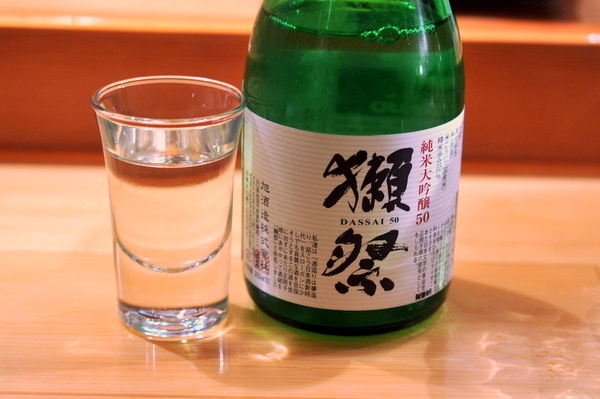 Sake is typically pasteurized twice which takes away some of the flavor but makes it safer to transport during the hot summer months. The hiya-oroshi is a bit more nuanced than the regular version with grape and floral notes accompanying the soft silky texture. 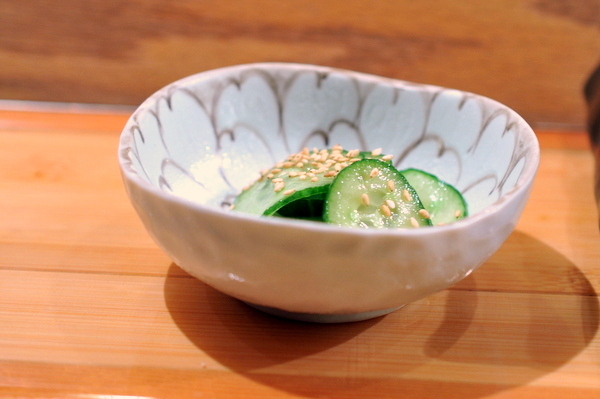 Right after we sat down, Dai-san presented us with a small dish of cucumbers. The tangy crunch was effective for whetting the appetite for the meal to come. 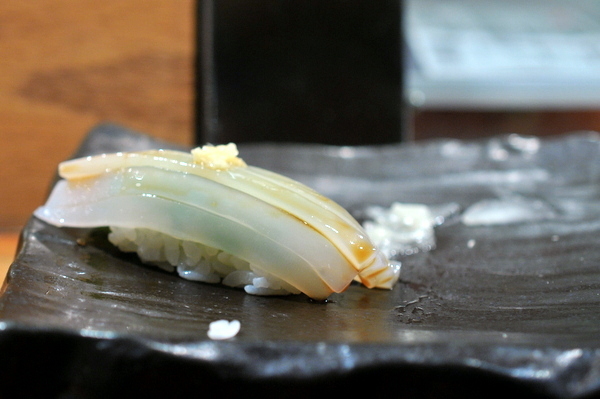 The hirame felt a bit thicker and more substantial than the typical cut with the classic mild flavor that highlighted the spicy tang of the radish. Once upon a time yellowtail was my favorite sushi fish, the delicately scored meat melts in the mouth leaving behind a lovely oily smack. This was one of the more unconventional tai preparations I've had in sometime. 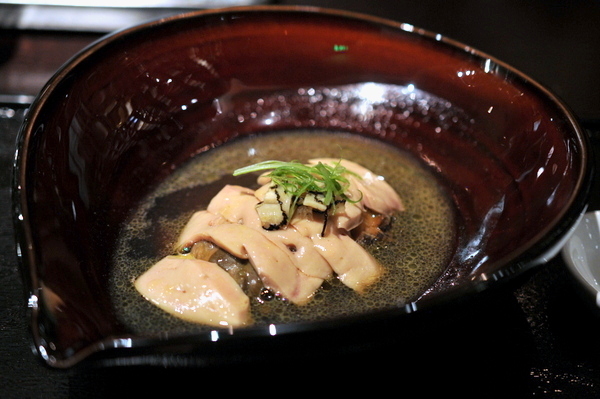 Instead of salt and lemon, Dai topped the fish with oil and soy giving it a flavor reminiscent of Chinese steamed fish. An accent of toasted jalapeno gives the bite a distinctive vegetal heat. Next up was a beautifully seared scallop. 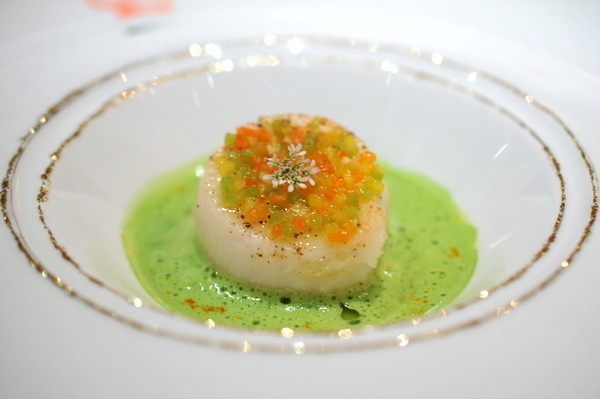 The bivalve retains the jellied texture and sweetened flesh while the charred salt and pepper gives the scallop a crunchy crust and savory counterpoint. 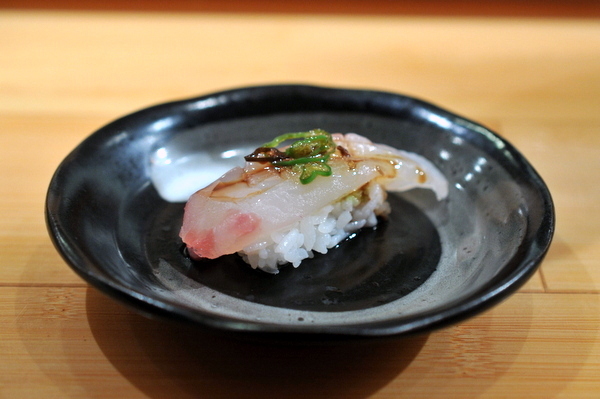 Dai's nigiri had some of the most vivid marbling that I'd ever seen on Amberjack. 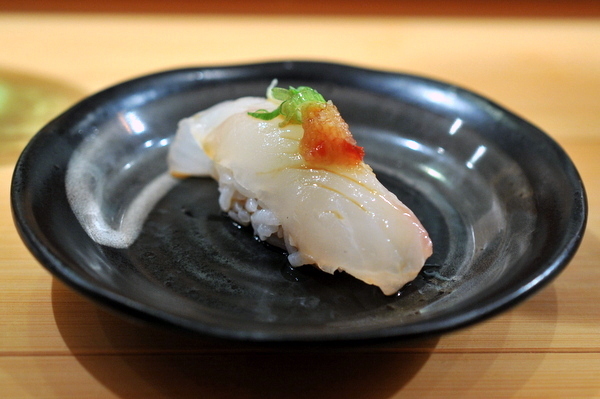 The flavor lived up to its fatty appearance with a dollop of yuzu kocho providing spicy salty tang to counter the weight of the fish. I've never been a big fan of the dense staid texture of cooked shrimp but I did like the iron-tinged heft of the cream sauce Dai paired with the prawns. 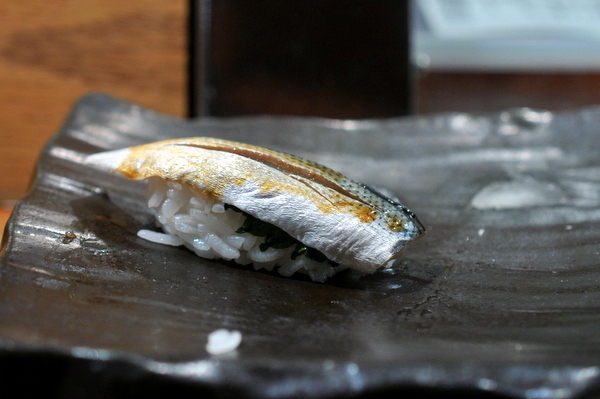 The mackerel was fantastically dense, almost gummy in texture. The bite of the ginger is very intense initially but as it fades the fish oils become more apparent. 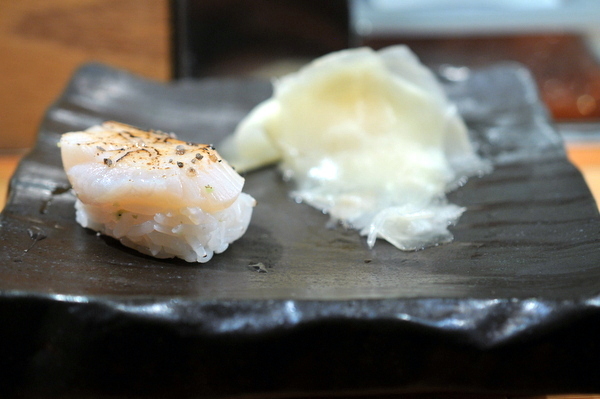 This was one of the most expressive pieces of salmon belly nigiri that I've ever had. A quick kiss of the blowtorch renders the fat, imparts a rich smoky essence, and gives the fish a lightly charred crust. 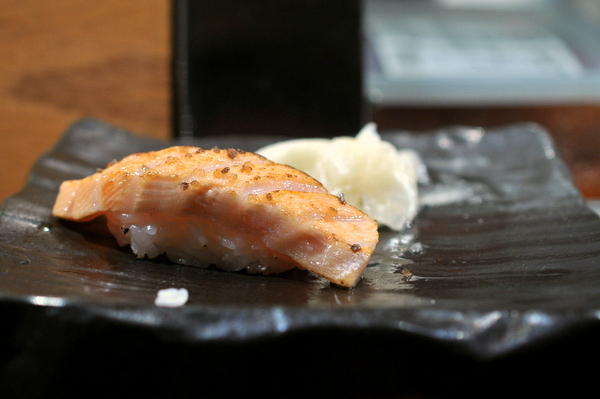 Following the salmon toro we get the real thing: a slab of light pink tuna belly threaded with tiny veins of white. 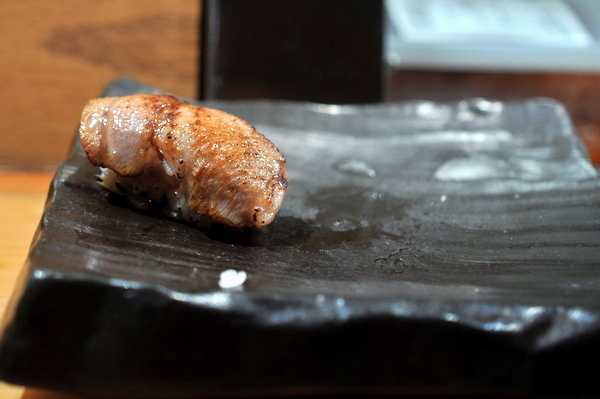 The meat posesses an intense richness but with an almost sweet cast to it, Dai certainly saved the best for last. 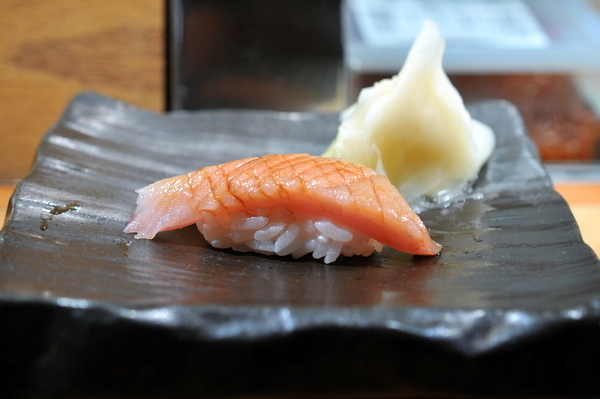 The 10-piece omakase dispensed with we asked Dai to just to serve us whatever he recommended. 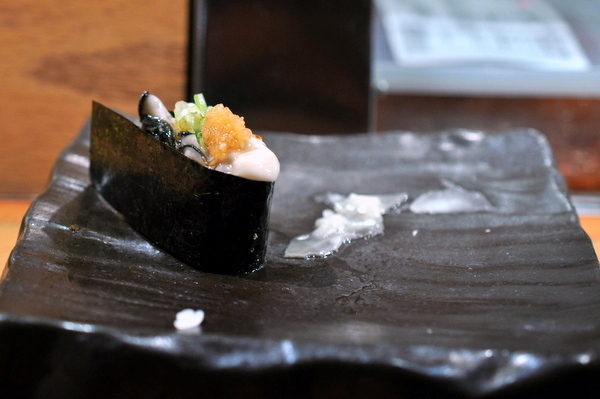 The piece of abalone I was given was surprisingly thick yet still quite tender while the thin ring of nori highlighted the shellfish's natural essence. I've been craving geoduck for the last few days and this snappy sweet morsel would have hit the spot were it not for the bits of shell. 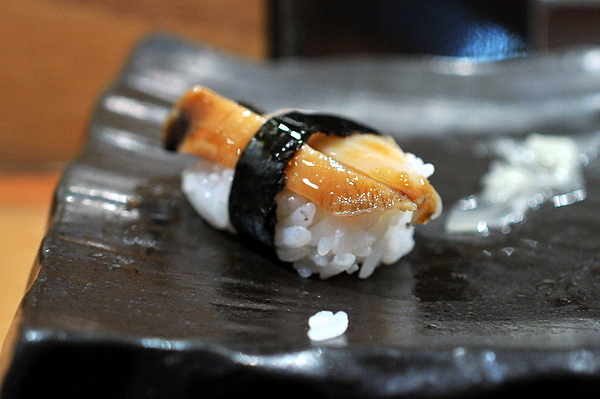 This was one of the few preparations of eel that didn't come drenched in sauce. Personally I thought the light dusting of salt was the perfect accent to emphasize the Anago's inherent salinity. Despite the light color the eel also had a bit of crust and caramelization to it. Even before it was served I noted the faded mustard yellow color on the uni, never a good sign. While the roe had some sweetness upfront a creeping brackish funk on the finish suggested the urchin was none too fresh. Dai was a bit surprised when we asked which prefecture the beef came from but he quickly recovered his composure and gamely answered Kagoshima. The intense marbling of the beef is complimented by an intense smoky beef-y char. 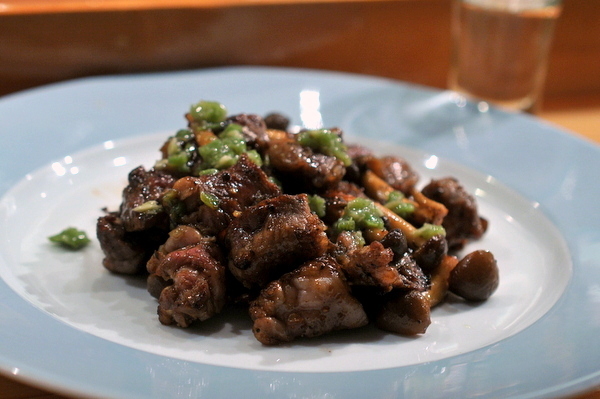 The brush of soy and daikon topping add a much needed sense of restraint to the beef. 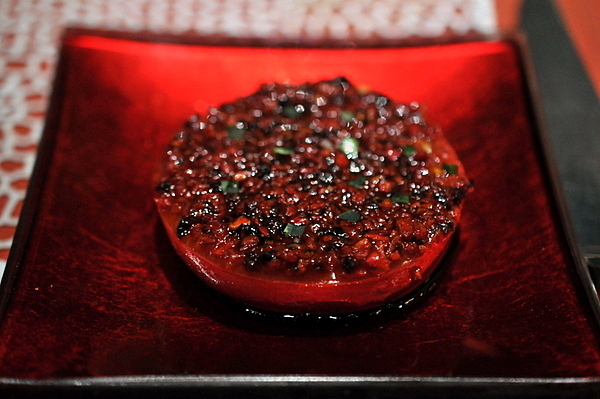 After the one-dimensional Wagyu at CUT it was nice to experience such a complex and balanced preparation. Our second sake was a half bottle of Dassai 50. Compared to the Onikoroshi the Dassai is substantially sweeter with almost tropical fruit notes on the nose and the palate. One of the most memorable pieces of the night. 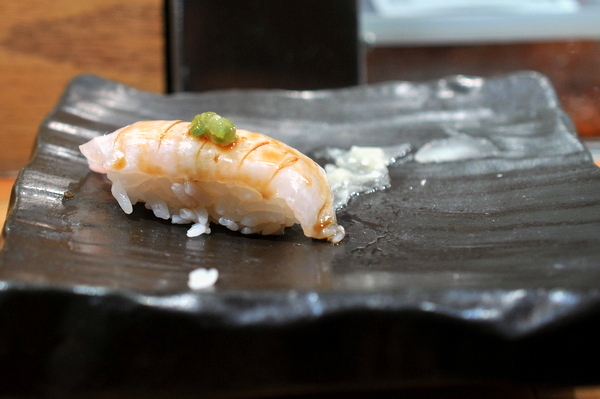 The oyster came gunkan style and topped with tart accompaniments accentuate the Kusshi's fantastic melon-like sweetness. This was one of the softer pieces of engawa that I've had. Though tasty, I keenly missed the crunchy snap which is one of the most appealing features of this rare treat. 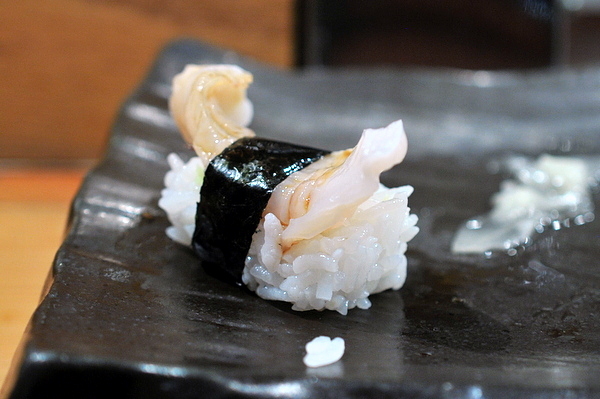 Squid used to be a constant on my sushi dinners but it fell out of favor after a time. The thick strips of raw squid had an almost plump firmness but ended with a sweet creaminess and spicy kick from the ginger. We asked Dai if he could do something different with the Wagyu and after a moment his partner Tsutomu headed into the kitchen and when he came back he brought this plate with him. 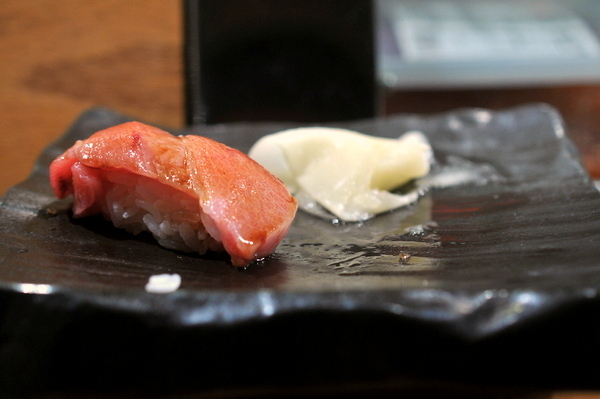 The meat was nicely cooked with plenty of fat but lacked the nigiri's finesse. The meat also had a fair amount of gristle, perhaps this was made from the trimmings left after prepping the Wagyu nigiri. 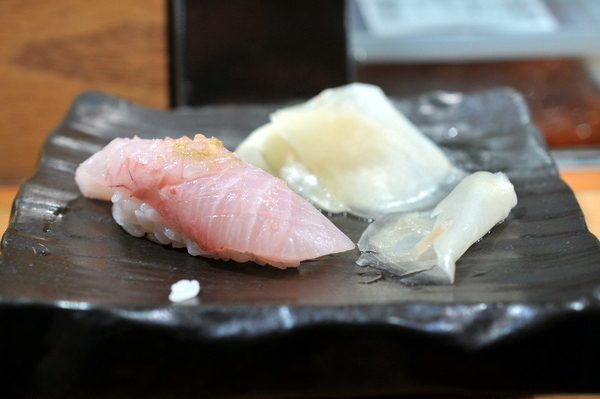 The addition of shiso here was a stroke of genius adding a luscious floral fragrance to an otherwise pedestrian Kohada. We opted for a second piece of toro seared this time. 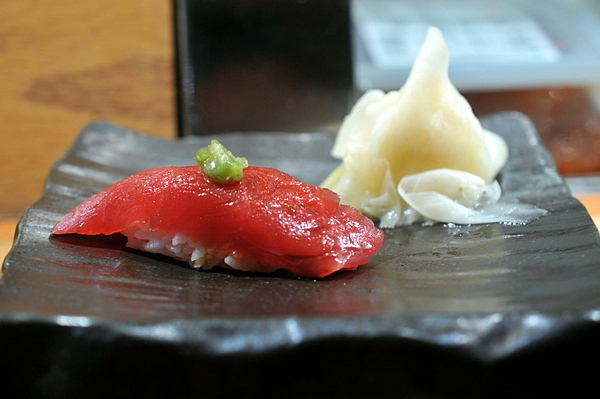 After passing through the thin curtain of tangy char and smoke one finds the same lush fatty goodness of the raw toro. 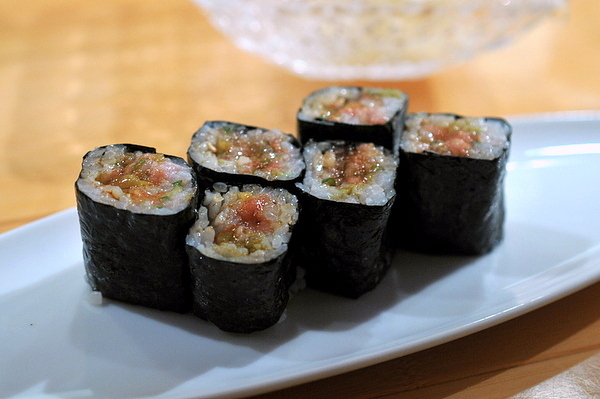 The typical blue crab roll is little more than rice, crab, and mayo wrapped in nori. 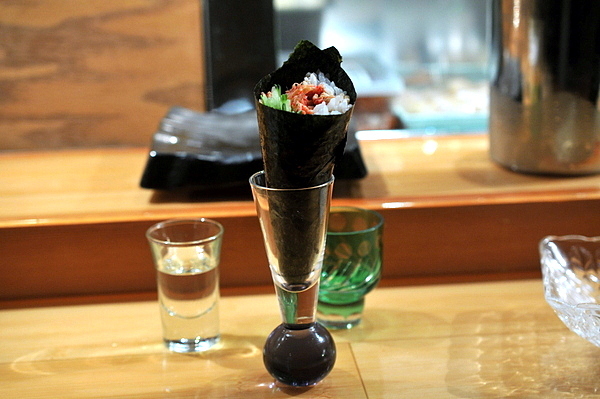 Murasaki's preparation adds a spicy masago and cucumber. The sweetness of the crab is intricately bound with the habanero's heat which is in turned tempered by the rice and the refreshing succulence of the Julienned cucumber. 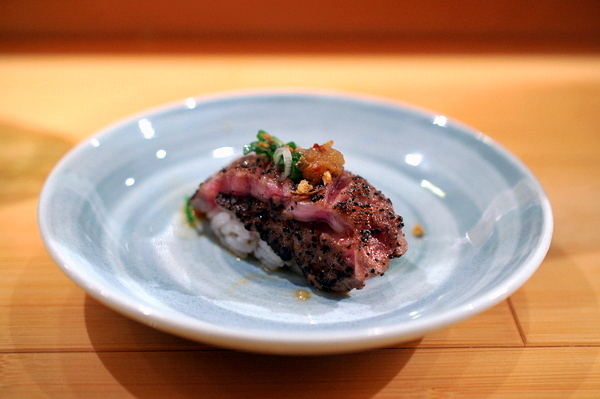 The meal ended with a cut roll filled with toro mixed with scallion ginger and Kampyo. 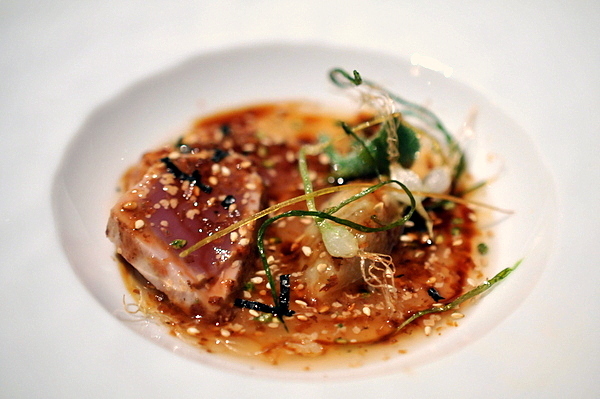 The finely minced tuna exudes a fishy savor but the pickled radish helped keep the richness in check. 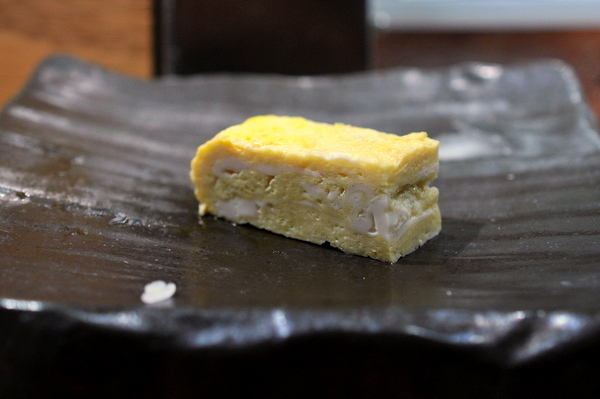 This was a classic Tamago, cool, hammy, and lightly sweet. 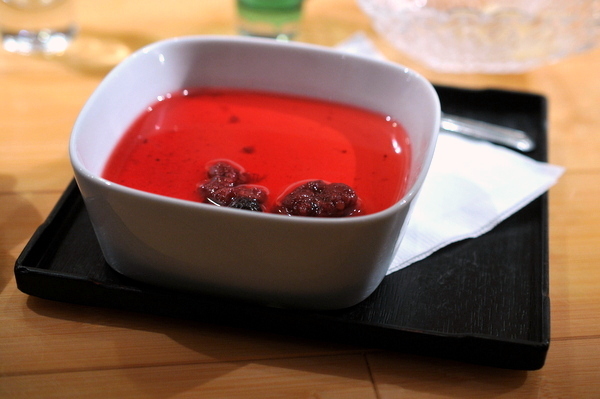 I found the panna cotta a bit lacking, though the raspberry has a light tartness the custard itself felt a bit watery. 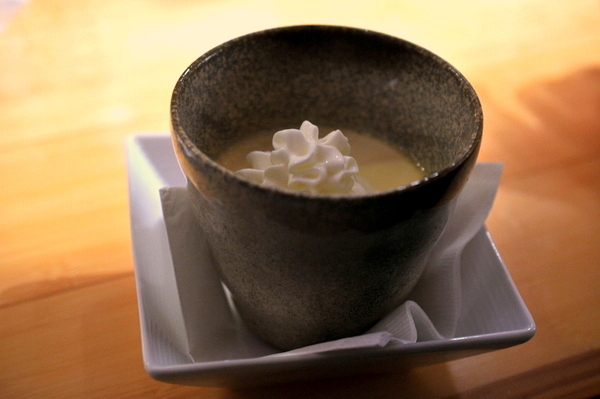 This dessert was more my speed; creamy with plenty of burnt sugar goodness. Towards the end of the night co-owners Tsutomu and Dai posed for a couple pictures. Unlike some other itamae, these two don't take themselves too seriously which helps put newcomers at ease. 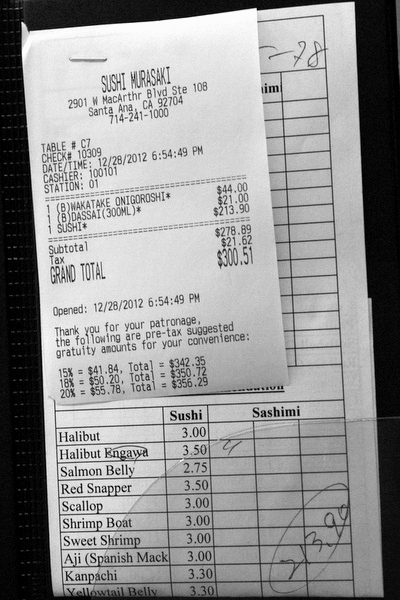 What a world of difference sitting at the bar makes; aside from the uni and mirugai, the sushi was all very impressive. While the issues I had with my last meal were still present, they were nowhere near as prominent this time around. Overall I'd say Murasaki falls a bit short of the top spots in Orange County but still well worth a visit. 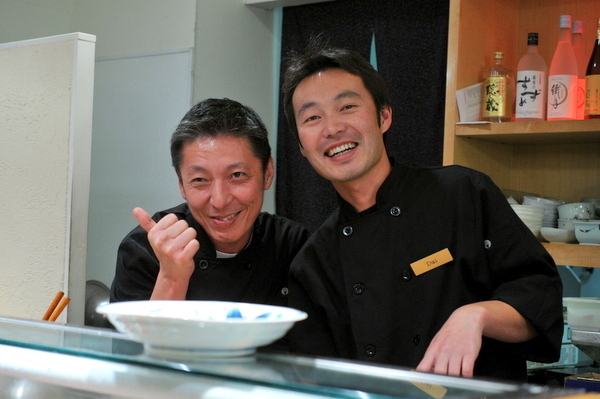 For the best experience, I'd steer clear of the cooked dishes and let Tsutomu and Dai work their magic at the bar. 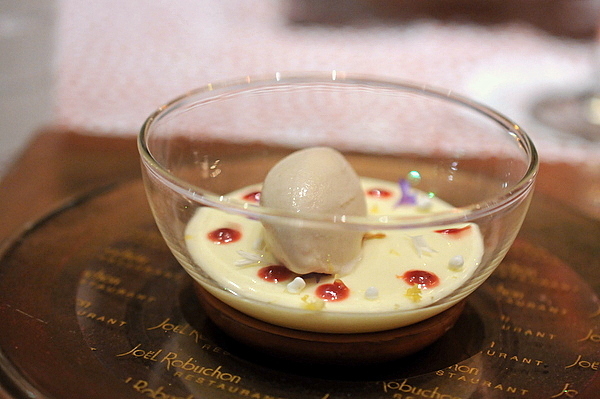 My last trip to Joel Robuchon's Las Vegas flagship so enamored one of my companions that he couldn't wait to return. With a larger party this time around we were able to secure the private dining room which felt noticeably more formal than the warm and inviting main dining room. Naturally we opted for the full 16-course Menu Degustation and with such a large party we decided to go with a formal wine pairings rather than just selecting a couple bottles. 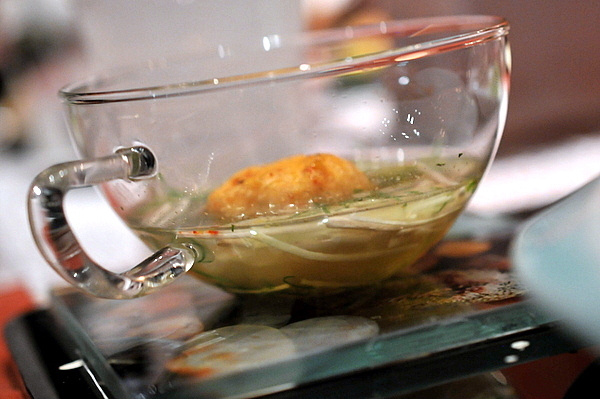 Our amuse was a blend of avocado and grapefruit that was both creamy and bracing. 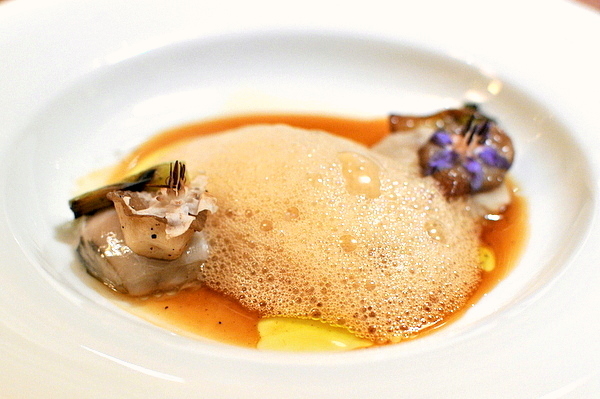 Though I'm a huge fan of acidity this dish was a bit too astringent and austere. 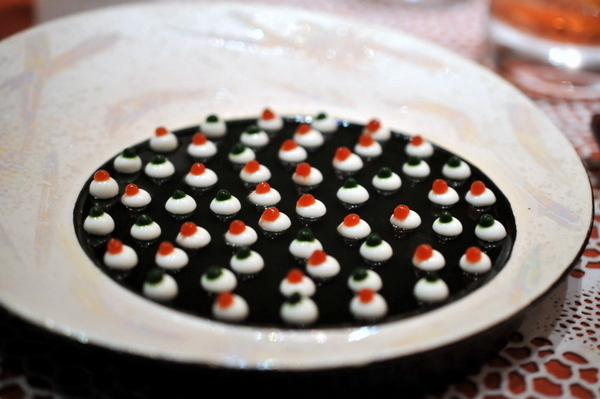 One of the most visually arresting dishes I've ever seen, this features a thick tomato steak coated with herbs and balsamic and a dish of tomato gelee dotted with mozzarella and tomato and basil purees. Unlike my previous visit we were advised to use the tomato water as a "dressing" for the base of the salad. The result is a delightful blend of succulent tomato with robust herbaceousness and a gritty tang from the mozzarella, truly a gentrified yet faithful variation of the timeless Caprese salad. 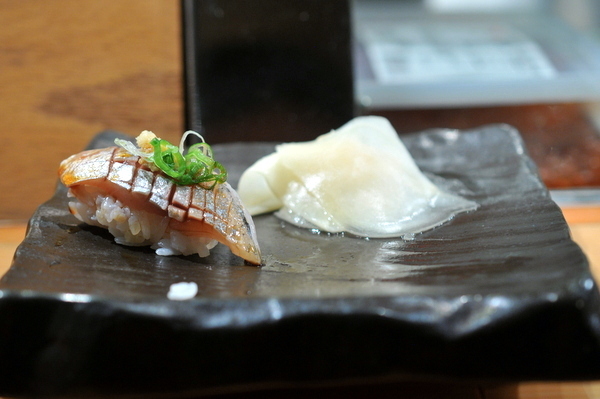 Had I not had this course recently I might not have noticed but, the slices of fish felt a hair thinner and less substantial this time around which made it less less able to balance out the harshness of the pickled radishes. 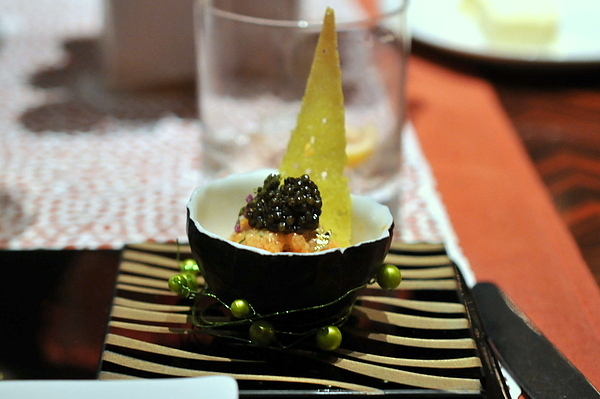 Salmon tartare with caviar is nothing groundbreaking but the creamy body and nuanced salinity made this preparation worthy of the name Robuchon. 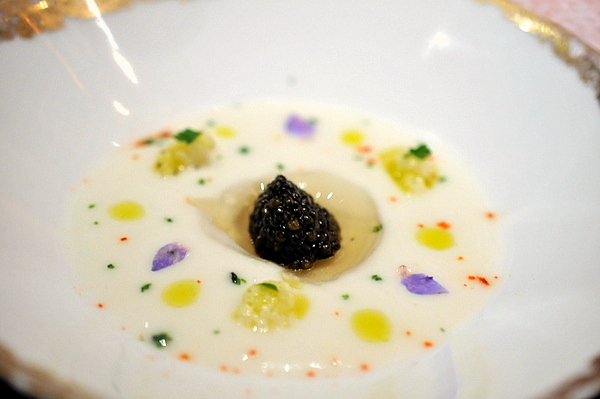 Of the trio, I thought this dish made the most effective use of the caviar. The roe bursts with vibrant salinity that contrasts beautifully with the restrained sweetness of the cauliflower though I thought the decision to omit the dashi gelée reduced the dish somewhat. 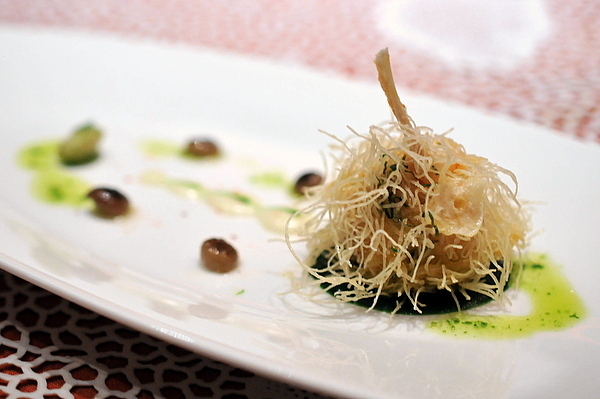 One of Robuchon's signatures, this course pairs the intoxicating blend of fragrant sauce and earthy mushrooms with the salinity of the frog leg while the crispy shroud of phyllo adds a buttery savor and textual contrast to the mix. This is the only course that actually improved since my previous visit with the flavors and textures feeling a bit more vivid and forceful this time around. Finally, proof that the staff at Joel Robuchon is indeed mortal. Though the rich green curry was as zesty and aromatic as I remember, the scallop itself was horribly overdone and rubbery. When I mentioned the issue to our waiter he seemed to shrug it off which I found a bit insulting. Another of Robuchon's signatures the langoustine was as brilliant as its ever been. A tender starchy skin enrobes a supple bounty of langoustine that convneys a resonant briny sweentess. 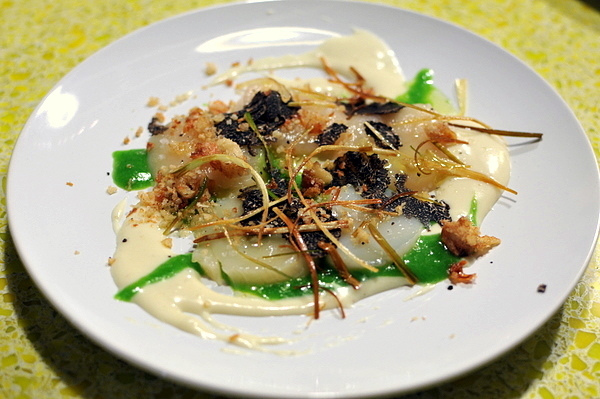 The truffles provide an acute earthiness while the shredded cabbage adds a bitter vegetal couterpoint to the dish. The third course of the crustacean trio was quite the change from its rich buttery siblings. The ball of ground tiger prawn is imbued with the sweet brine of shellfish while the vegetable broth has a soothing zen-like tea flavor. To say that I've never been a fan of kobocha squash would likely be putting it mildly. 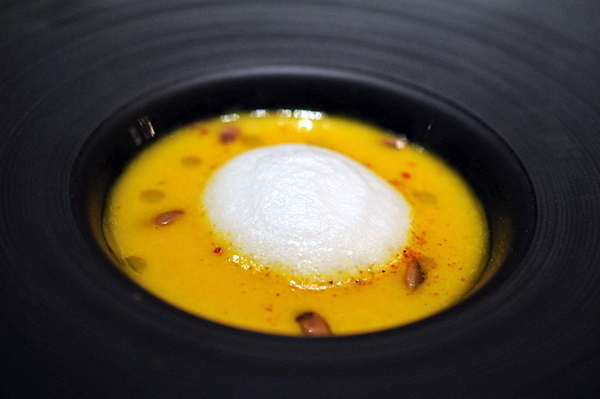 The squash puree is well suited to the unctous base of but the sweetness would have still been a bit much if not for the ginger which was key in balancing the sweetness of the kobocha... a silky symphony indeed. Roundly disliked by our entire party, this is the first course that I've had at Joel Robuchon that I thought was inherently flawed. Ironically the bass itself was absolutely sublime. The pungent funky tang of the verjus was far too powerful for the delicate fish. 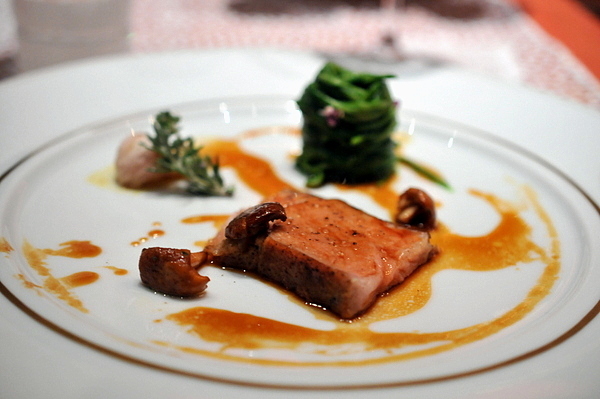 The sous vided veal exhibited all the best traits associated with the meat, tender and supple. A bit delicate for the final protein of the night, the mild flavor of the meat might have been an issue were it not for the accompaniments of pungent garlic and rich aromatic pesto. 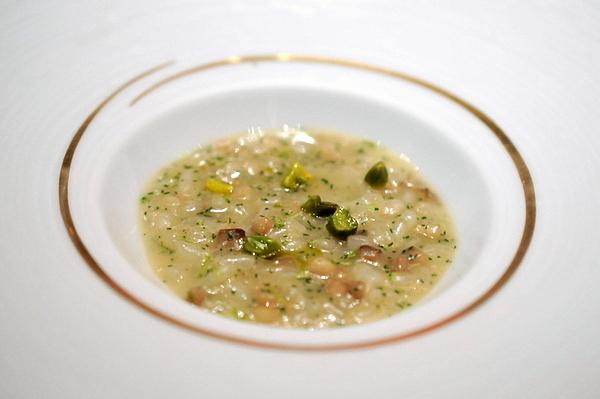 The faux risotto was one of my favorite courses from the last trip and it remains just as sublime. The creamy sauce is reminiscent of a traditional risotto while the sprouts bring a vegetal levity not found in conventional preparations.. This was one of the few pleasant surprises of the entire meal. 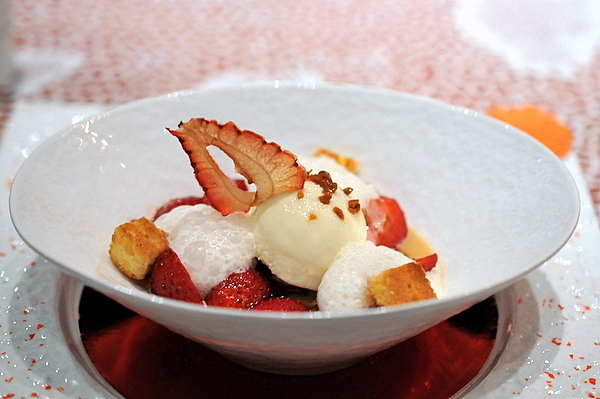 My last visit also featured a sublime strawberry dessert that I thought couldn't be surpassed, but this preparation was even better. The varied sweetness of the fruit and panna cotta compliment each other beautifully while the biscuit added a lovely underlying butteriness. 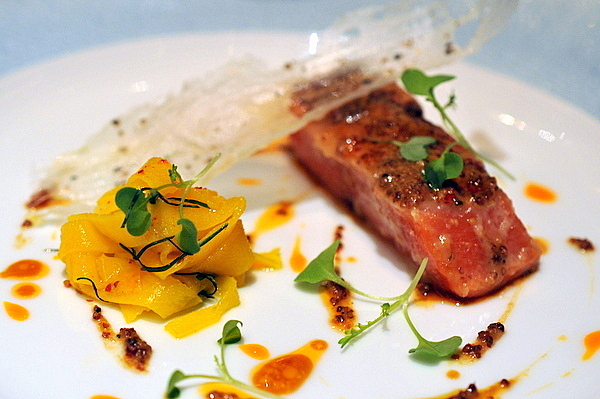 The citron looks deceptively delicate but the flavors proved to be quite bold. The conventional pairing of hazelnut ice cream with an ethereal crisp of Gianduja chocolate is deftly contrasted with the tart citric essence like a quixotic lemon-drenched Ferrero Rocher. Back in the main dining room our server brought the tea cart without being prompted this time around the staff seemed annoyed that we requested it. 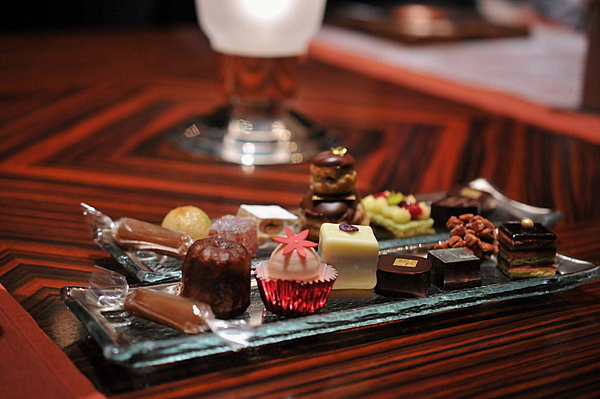 Likewise we were brought a selection of mignardises for the table rather than being able to pick our own selections. While I had no problems with the after dinner snacks, the presentation or lack thereof, bothered me greatly. Its rare for me to visit a restaurant of this caliber twice in such a short span of time, but the large number of repeat courses afforded me an accurate baseline for comparing the two experiences. Unfortunately aside from the frog and strawberry the food was consistently weaker this time around. Likewise, the service was colder and less attentive; perhaps functions of being in the private dining room. While this experience does take some of the luster off Robuchon's image, even on an off night Robuchon surpasses most other restaurants. 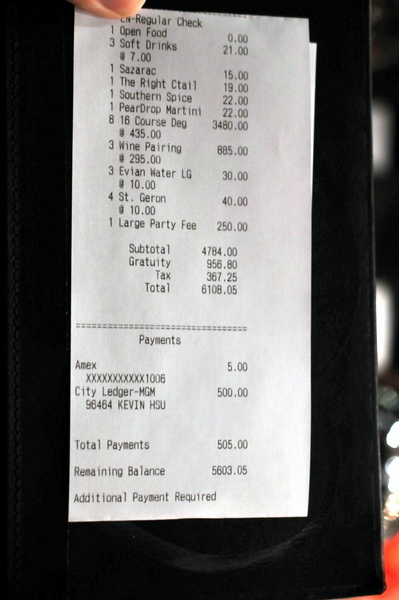 I recommend avoiding the private dining room if at all costs; save the $250 premium and spend it on a nice bottle of wine instead.